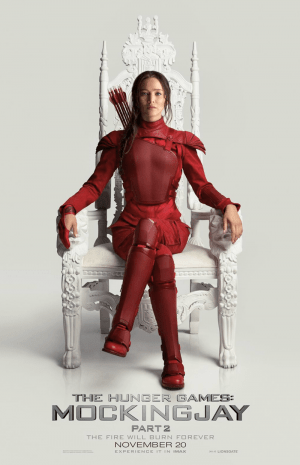 FILM REVIEW – THE HUNGER GAMES: MOCKINGJAY, PART 2. With Jennifer Lawrence, Josh Hutcherson, Liam Hemsworth, Donald Sutherland, Julianne Moore. Written by Peter Craig and Danny Strong. Directed by Francis Lawrence. Rated PG-13 for intense sequences of violence and action, and for some thematic material. 137 minutes. Two points need to be made about THE HUNGER GAMES: MOCKINGJAY, PART 2. First, it is a solid conclusion to the film adaptation of the book series. Second, the third book in the series never should have been split into two films. People unfamiliar with the books who wondered why “Part 1” didn’t seem to go anywhere can now see the payoff to all those set-ups. Without any sort of recap, the film picks right up where the last one left off. President Coin (Julianne Moore) is the leader of the rebel forces against the cruel and effete President Snow (a deliciously evil Donald Sutherland). Katniss (Jennifer Lawrence) is recovering from the raid that rescued Peeta (Josh Hutcherson), who has been brainwashed into hating her. Their relationship–a triangle, really, with Gale (Liam Hemsworth) as a rival for Katniss’s affections–is a key subplot. The main story is the revolt, and what role Katniss will play. Coin wants to hold her back making propaganda videos, but she’s hellbent on taking out Snow herself. Much of the film is her journey through the battle for Capital City, where Snow has laid booby trapped “pods” almost everywhere they turn. Ironically, Katniss– as the “Mockingjay”–has become the symbol of the revolution for both sides. Although the dystopian YA novel (and movie adaptation) has become a cliché, “The Hunger Games” has an unexpected payoff which the film preserves. Suffice to say the overall story is about a young woman being used and abused by the adults in authority who finally comes into her own, taking control of her life. In a sense, the series can be taken as a metaphor for making the transition from being a teenager to being a grown-up. Lawrence, who has become a star on the basis of these films, has shown herself to be a talented young actress able to handle a wide range of roles. Her performance as Katniss across the four movies is a standout among films based on YA books. She began headstrong but not always sure of herself, and finally comes into her own. Moore and Sutherland only appear together near the film’s end, but their portraits of the effects of power make it clear what’s at stake. There’s nice support from Woody Harrelson, Elizabeth Banks, Mahershala Ali, Stanley Tucci, and the late Philip Seymour Hoffman in roles they introduced earlier in the series. The weakest links are the love interests with both of them stuck in passive roles. Hutcherson at least has the excuse that Peeta is struggling against the drugging and torture he had undergone.